Messing with a successful formula is always a risky proposition, but so is thinking that good enough is good enough. Back in 2005, I developed a formula which incorporated some extraordinary new research on natural pain relievers—3 substances that not only relieved pain, swelling, and stiffness, but that when used in combination also helped rebuild damaged joints and tissue. This formula offered a three pronged approach to systemically relieving chronic joint pain and inflammation. It incorporated ASU to increase aggrecan levels, thereby helping to repair and rebuild damaged cartilage in the weight bearing joints. It made use of the unique ability of the undenatured type II chicken collagen found in UC-II™ to train the body's immune system to stop attacking joint cartilage. And it made use of ginger's ability to directly reduce pain and inflammation. This formula worked so well that even though it was not inexpensive, it became one of the best selling formulas at Baseline Nutritonals, and had one of their highest reorder rates. And on top of that, it not only was successful at relieving pain, it also turned out to be spectacular at protecting against periodontal disease. Which brings up the question: why mess with success? The answer is that it only worked for about 68% of the people who used it (keeping in mind that glucosamin and chondroitin only work for about 30% of the people who use them). Now economically, 68% is a huge hit for Baseline, but as a formulator, I obsess over the 30% who are being left behind. I realize that nothing will work for 100% of people, but what about 80-85%—rates we see for formulas like my pain oil? Anyway, ever since the formula was released, I've been looking for ways to improve its rate of effectiveness. One of the problems, of course, with changing a formula is that there's only so much room in a capsule. If you put something new in, you have to take something old out to make room for it. The trick, then, is making sure that the trade off produces a more effective formula, not just a different formula; and after two years of constant experimentation, I've been able to do that with this formula. I've found a way to add two ingredients to the formula that early research indicates may produce an effectiveness rate approaching 80-85%. The two new ingredients are CMO (a special Omega-9 fatty acid variant) and 5-LOXIN® (a very special boswellia serrata extract). With that in mind, let's look at the formula from top to bottom. In order to understand what ASUs are (apologies to Arizona State University) and how they work, we need to make a minor detour and talk about aggrecan. In fact, this discussion should help tie together some of the supplements that you may already be familiar with. Aggrecan is the acronym for a small bio-chemical molecule called, oxymoronically, the large aggregating chondroitin sulfate proteoglycan. Specifically, an aggrecan molecule consists of a protein backbone which is attached to up to 150 chondroitin sulfate chains and 60 keratan sulfate chains. Aggrecan is abundant in the human body and represents up to 10% of the dry weight of cartilage—keeping in mind that's quite substantial since articular cartilage (the cartilage found at the end of long bones) contains up to 75% water. As many as 100 of these aggrecan monomers will then interact with hyaluronic acid molecules to form a single massive chain called an aggregate, which is a key component of joint cartilage. Aggrecan plays a crucial role in the functioning of articular cartilage (the cartilage found in joints), primarily working to maintain high levels of hydration in the cartilage—thereby keeping the cartilage healthy and functional. As a side note, it is the presence in aggrecan of large numbers of chondroitin sulfate chains that is primarily responsible for the osmotic pressure that results in articular cartilage being 75% water. Several years ago, researchers from the University Hospital in Liege, Belgium reported in the August 2003 issue of The Journal of Rheumatology that a phytosterol/sterolin extract concentrated from the oils found tightly bound to avocado and soybean fibers could significantly boost production of aggrecan, thereby helping slow down and even repair some of the damage caused by osteoarthritis—in as little as nine days. To make room for the two new ingredients, I had to pull out some of the ASU. Previously, I included 1000 mg a day of ASU in the formula. This was approximately three times more than anyone else used in their ASU products, and it definitely improved the effectiveness of the formula—not so much in helping with joint pain, but in its ability to help protect against periodontal disease. In the end, though, the primary purpose of this formula is to help with joint pain, so I decided to drop the ASU down to the commonly used level of 333 mg a day, which allowed me room to add the CMO and 5-Loxin®—thereby significantly increasing the efficacy of the formula when it comes to joint pain with only a small loss in periodontal benefit. In the past, I have recommended several immunomudulators including CMO (cetyl myristoleate) and L-Carnosine, but UC-II seems to represent a choice uniquely suited to dealing with joint and cartilage problems. Although this discussion ultimately applies to all forms of joint damage, for the moment, let's focus our attention specifically on rheumatoid arthritis. Rheumatoid arthritis (RA) is a common autoimmune disease in which killer T-cells of the body's own immune system (most likely triggered by invading bacteria) reprogram themselves to attack joint cartilage, resulting in inflammation and joint destruction. The current treatment strategies of suppressing immunity and inflammation offer only limited success. "Oral tolerance," on the other hand, is a long-recognized mechanism for inducing immune tolerance—that is, suppressing a misdirected immune response. But rather than suppressing the entire immune system, oral tolerance targets specific immune cells responsible for tissue damage. Inducing the immune system to tolerate joint cartilage, rather than identifying it as a "foreign" substance, requires a specific sequence of events to take place within that part of the immune system found in the gastrointestinal tract lining. Studies have shown that small doses of undenatured type II collagen can indeed trigger this particular sequence of events, thereby deactivating killer T-cell attacks of joint cartilage in humans.Other studies have demonstrated that the undenatured type II chicken collagen found in UC-II retains its activity when exposed to human digestive fluids, which is not necessarily true of other sources. Time-dose measurements by ELISA immuno-assay of UC-II activity have shown that it retains approximately 50% activity even after as long as 90 minutes after exposure to digestive juices. Most type II chicken collagen sold in dietary supplements is denatured, or hydrolyzed, which is another way of saying that the chemicals and high-heat used to process and refine it have changed its molecular configuration. An undenatured extract is made using little or no heat and limited processing. It is usually extracted using pepsin with just enough processing to concentrate the collagen and make it soluble. Denatured or hydrolyzed extracts, on the other hand, typically use high heat, acids, and enzymes to make the protein molecules more soluble; but these methods fundamentally alter the structure of the protein. Denatured proteins are often called hydrolyzed proteins—thus denatured collagen is often called hydrolyzed collagen. This does not make it useless. Hydrolzyed type II chicken collagen still has value as a source of some of the components of aggrecan, including collagen itself, hyaluronic acid, chondrotin sulfate, and glucosamine. But to receive this benefit you need to consume it in large amounts, as much as 3-10 grams a day. But more importantly, one significant thing does change in the process of denaturing. When denatured, type II chicken collagen loses its immunomodulating ability. Type II collagen must be in its native (undenatured) form to be effective in this capacity. UC-II is extracted from chicken sternum cartilage using a patented, low-temperature process that ensures the undenatured biological activity of the type II collagen even when exposed to digestive juices for 90 minutes or more. As mentioned earlier, undenatured collagen administered orally works with the immune system to promote healthy joints by a process called oral tolerization. This process helps the body to differentiate between foreign invaders, such as bacteria, and elements that are good for the body, such as nutrients. The process of oral tolerization takes place in the small intestine where food is absorbed. Through a complex process, lymphoid tissue in the mucosal lining of the small intestine screens incoming compounds and serves as a "switch," turning the body's immune response on or off to foreign substances, depending upon what that substance is. In the case of undenatured type II chicken collagen, small amounts (typically around 10 milligrams) taken orally have been shown to correct a faulty immune response specifically targeted at the type II collagen present in bone joint cartilage—in effect, modulating the body's immune response so it works correctly once again. At a cost of over $17,000 per kilogram of active ingredient, UC-II is undoubtedly the single most expensive ingredient I have ever used in a formula. Fortunately, it only takes 10 mg a day of its active ingredient for maximum effect. (In fact, it loses effectiveness if too much is used, losing all effectiveness at levels over 20 mg a day). But cost aside, the fact that it specifically addresses the problem of the immune system destroying the body's own cartilage mandates its inclusion in the formula. There have been a number of studies conducted with UC-II on both animals and humans, including research at the Harvard University Medical school—all of which have shown that the undenatured type II chicken collagen found in UC-II effectively reprograms the immune system to promote healthy joints and increase joint mobility and flexibility. In a pilot clinical study, for example, 5 older women (58-78 years old) suffering from significant joint pain were given undenatured type II chicken collagen (10 mg/day) for 42 days. Improvements in pain reduction and joint flexibility were reported, along with reduced morning stiffness. In another study, researchers at Harvard Medical School found that six of ten rheumatoid arthritis patients taking undenatured type II collagen for three months showed substantial improvement, while one patient recovered completely. In addition, there were no side effects. And finally, in a 90-day, double-blind, placebo-controlled, follow-up study on patients with severe rheumatoid arthritis, Harvard scientists found that 28 patients taking undenatured type II collagen showed significant improvement compared to the placebo group, while four patients recovered completely. When we talk about a 10 mg dose, we're talking about 10 mg of active glycosylated undenatured type II chicken collagen. But there are no readily available pure sources of this component. Standard hydrolyzed chicken collagen, as explained earlier, has virtually none. And most sources of undenatured collagen offer it in the range of 10-25% concentrations. In UC-II, for example, active glycosylated undenatured type II chicken collagen comprises 25% of the whole. That means it takes 40 mg a day of UC-II to get 10 mg of active undenatured collagen. I have noticed that several of the supplement providers who are using UC-II in their formulas have mistakenly used 10 mg of UC-II itself. That means they are only providing 2.5 mg of active undenatured collagen. Given the cost, I can see why, but from your perspective, you want a full 10 mg, which requires 40 mg a day of UC-II—or more from other sources. There are two cyclo-oxygenase (COX) enzymes present in the human body, COX-1 and COX-2. The COX-1 enzyme is found in most tissues and is necessary for a variety of important internal functions, such as protecting the stomach lining, maintaining renovascular function and platelet aggregation. The COX-2 enzyme, though, has an entirely different function. It is a necessary component of the inflammation process, which is a normal, healthy attempt by the body to heal itself. However, when inflammation gets out of control (such as in the case of arthritis or other chronic inflammatory disorders), ongoing pain and discomfort is the result. Prescription COX-2 inhibitors such as Vioxx and Celebrex have proven helpful in relieving out of control inflammation and its accompanying pain—but with notable side effects such as an increased risk of heart attacks and strokes. That's where botanical COX-2 inhibitors such as ginger can help. Botanical COX-2 inhibitors block the action of the COX-2 enzyme in much the same way as prescription drugs do, but without the side effects. Although it's probably better known for its anti-nausea properties, ginger is also an effective COX-2 inhibiting anti-inflammatory herb that has historically been used for arthritis and rheumatism. In a study of patients with rheumatoid arthritis, osteoarthritis, and muscular discomfort, the majority of those who received ginger experienced, to varying degrees, relief of pain and swelling. None of the patients reported adverse effects during the period of ginger consumption, which ranged from three months to 2.5 years. Another double blind trial found ginger extract to be effective at relieving pain in people with osteoarthritis of the hip or knee. Likewise, in another double blind study, ginger was significantly more effective than a placebo in pain relief and overall improvement. Ginger contains very potent anti-inflammatory compounds called gingerols. These substances explain why so many people with osteoarthritis or rheumatoid arthritis experience reductions in their pain levels and improvements in their mobility when they consume ginger regularly. In two clinical studies involving patients who responded to conventional drugs and those who didn't, physicians found that 75% of arthritis patients and 100% of patients with muscular discomfort experienced relief of pain and/or swelling. A twelve month placebo-controlled, double-blind, crossover study published in Osteoarthritis Cartilage magazine (no really, that's its name) tracked 29 patients with painful arthritis in the knee (6 men and 23 women ranging in age from 42-85 years). By the end of the first six months, those given ginger were experiencing significantly less pain on movement and handicap than those given placebo. Pain on movement decreased from a score of 76.14 at baseline to 41.00, while handicap decreased from 73.47 to 46.08. In contrast, those who were switched from ginger to placebo experienced an increase in pain of movement (up to 82.10) and handicap (up to 80.80) from baseline. In the final phase of the study when all patients were getting ginger, pain remained low in those already taking ginger in phase 2, and decreased again in the group that had been on placebo. Ginger extract helps to relieve chronic pain by reducing inflammation. Cetyl myristoleate (CMO) is the common name for cis-9-cetyl myristoleate. (You can think of it as a relative of the Omega-9 fatty acid found in olive oil.) It is a completely natural medium chain fatty acid found in certain animals, including cows, whales, beavers, and mice—but not in people. CMO was discovered in 1972 by Harry W. Diehl, Ph.D., a researcher at the National Institutes of Health. At the time, Dr. Diehl was responsible for testing anti-inflammatory drugs on lab animals. In order for him to test the drugs, he first had to artificially induce arthritis in the animals by injecting a heat-killed bacterium called Freund's adjuvant. Dr. Diehl discovered that Swiss albino mice did not get arthritis after injection of Freund's adjuvant. Eventually, he was able to determine that cetyl myristoleate was the factor present naturally in mice that was responsible for this protection. When CMO was injected into various strains of rats, it offered the same protection against arthritis. There have been three notable studies on humans. In 2002, a double blind study of 64 people with chronic knee pain, published in the Journal of Rheumatology, concluded that CMO provided a significant functional improvement in range of motion vs placebo. In fact, the study concluded that CMO “may be an alternative to the use of nonsteroidal antiinflammatory drugs for the treatment of osteoarthritis." It functions as an immunomodulator—helping to stop an errant immune system from attacking joint cartilage. In animal studies, dogs suffering from osteoarthritis received boswellia extract once daily for six weeks. After just two weeks, 71% of the animals showed significant improvement in clinical symptoms of arthritis, including reduced pain, stiffness, and lameness. In a human study, boswellia was similarly shown to be effective in adults with osteoarthritis. Thirty subjects with osteoarthritis of the knee took part in a 16-week, randomized, double-blind, placebo-controlled trial. All of those who took a boswellia supplement reported less pain and swelling, increased knee flexion, and the ability to walk a greater distance. But it's not just arthritis. Boswellia seems to have the ability to reduce all forms of inflammation. In studies, bronchial asthma was reduced in 70% of 40 patients treated with 300 mg three times daily for 6 weeks in a double-blind trial. It has also proven effective in helping control the inflammation associated with Crohn's disease and colitis. Boswellia works through entirely different mechanisms than anti-inflammatory drugs. Whereas most drugs function as Cox enzyme inhibitors, boswellia works by inhibiting lipoxygenase enzymes (LOX), which are powerful contributors to inflammation and disease. By inhibiting LOS enzymes, boswellia effectively blocks leukotriene synthesis. Leukotrienes play a major role in promoting a whole host of age-associated, inflammation-related diseases including joint problems, intestinal disorders, cancer, and lung related disease. And finally, it appears that boswellia has the ability to modulate the immune system and inhibit inflammatory activity, thereby helping with a number of autoimmune conditions, including rheumatoid arthritis. Boswellia is a great herb for helping with inflammation related conditions—with two caveats. And even with standardized extracts, it takes a lot (1-3 grams per day) to get the desired effect. Which brings us to 5-LOXIN. 5-LOXIN is a new, patent-pending boswellia extract that provides 30% acetyl-11-keto-beta boswellic acid (the most bio-active compound found in boswellia) at levels ten times more concentrated than ordinary extrracts. It allows us to use much lower dosages of boswellia (100 mg) while achieving much greater results. As an added bonus, 5-LOXIN has been shown to inhibit matrix metalloproteinase (MMP's), a class of enzymes that plays a role in breaking down cartilage, collagen, and connective tissues—and is a major contributor to certain forms of heart disease. This formula now offers a five pronged approach to systemically relieving chronic joint pain and inflammation. 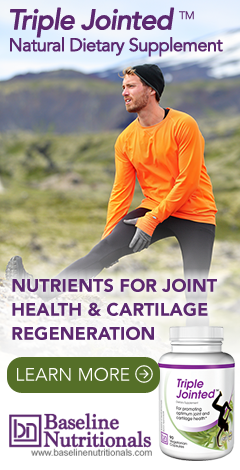 It makes use of the unique ability of the undenatured type II chicken collagen found in UC-II™ to retrain the body's immune system to stop attacking joint cartilage. And it makes use of the ability of 5-LOXIN to nutritionally support the body's inflammation control mechansims. Immune boosters and pathogen destroyers. Once again, the "scientific community" is years late in acknowledging the commonly known fact that, in most cases, joint pain is related to a compromised immune system. Take rheumatoid arthritis, for example. The Journal of Clinical Pathology has finally endorsed what the Mayo Clinic demonstrated conclusively years ago: that bacteria are involved. And new research is indicating that mycoplasma infections may be responsible for as much as 50% of all chronic disease, including arthritis. Glucosamine is not a cure, but for some people 1,000-2,000 mg a day may provide some relief. Studies are decidedly mixed, but if it works for you, that's all that counts. Systemic proteolytic enzymes can be remarkably effective in reducing inflammation throughout the body. Reducing the imflammation can go a long way in stopping the damge from progressing any further—in addition to reducing the pain. MSM is a naturally occuring sulfur compound found in our bodies and in many foods. When taken as a supplement, it can play a major role in reducing joint inflammation. What is the name of the product for systemic relief as discussed! Most of Jon Barron's formulas are sold by Baseline Nutritionals, you would have to contact them about shipping. You can see the list of recommended formulas on our products page and a link to each company.